On this blog and others, most comments about my previous post “Yet another trick of cosmic rays” have been friendly. Thank you. But some people still want to dismiss all the meticulous experimental, observational and theoretical work of Henrik Svensmark and his colleagues in the Danish National Space Institute by saying there is simply no link between cosmic rays and the climate. Having written two books on the subject, and still engaged with it, I could in rebuttal flood this post with evidence of many kinds, on time scales from days to millennia or longer. I’ll content myself with just one pair of graphs spanning 50 years. They’re from a 2007 report by Svensmark and the Institute’s director, Eigil Friis-Christensen, and they’re based on a European Space Agency project called ISAC. The carbon dioxide boys and girls would die for a match of cause and effect of this quality. Cosmic ray intensity is in red and upside down, so that 1991 was a minimum, not a maximum. Fewer cosmic rays mean a warmer world, and the cosmic rays vary with the solar cycle. The blue curve shows the global mean temperature of the mid-troposphere as measured with balloons and collated by the UK Met Office (HadAT2). In the upper panel the temperatures roughly follow the solar cycle. The match is much better when well-known effects of other natural disturbances (El Niño, North Atlantic Oscillation, big volcanoes) are removed, together with an upward trend of 0.14 deg. C per decade. The trend may be partly due to man-made greenhouse gases, but the magnitude of their contribution is debatable. 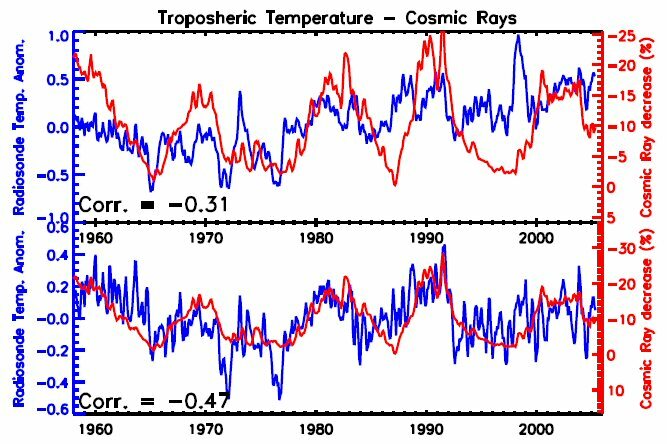 From 2000 to 2011 mid-tropospheric temperatures have remained pretty level, like those of the surface, despite the continuing increase in the gases – in “flat” contradiction to the warming predicted by the Intergovernmental Panel on Climate Change. Meanwhile the Sun is lazy, cosmic ray counts are high and the oceans are cooling. Svensmark, H. and Friis-Christensen, E., “Reply to Lockwood and Fröhlich – The persistent role of the Sun in climate forcing”, Danish National Space Center Scientific Report 3/2007.